Ole Zim’s Wagon Shed has been serving Sunday meals since February 2, 1964. We invite you to dine with us on Sundays from 11:00 am to 3:00 pm. Reservations and walk-ins are welcome. Our menu contains delicious items for any taste. Choose from selections such as; our famous traditional chicken dinner, a seafood platter, or our all you can eat family style option. If you will be dining as part of a group consisting of 16 guests or more, we strongly suggest reservations with your choice of either family style or large group menu. We invite you to make some memories yourself by joining us next Sunday for dinner! If you are a large group or if it is just the two of you, the all you can eat option of our family style meals are a great choice. The food is served individually to the tables in bowls and on platters so that you may choose what and how much you would like. Meals include two meat choices; ham and chicken or ham, chicken, and roast beef. The meal is also served with mashed potatoes and gravy, noodles, vegetable, jello salad, homemade bread and butter, pie and beverage. Sorry, no food may be taken home. Our large group menu consists of three meat selections and differs from the family style in that the meals are served on a plate. 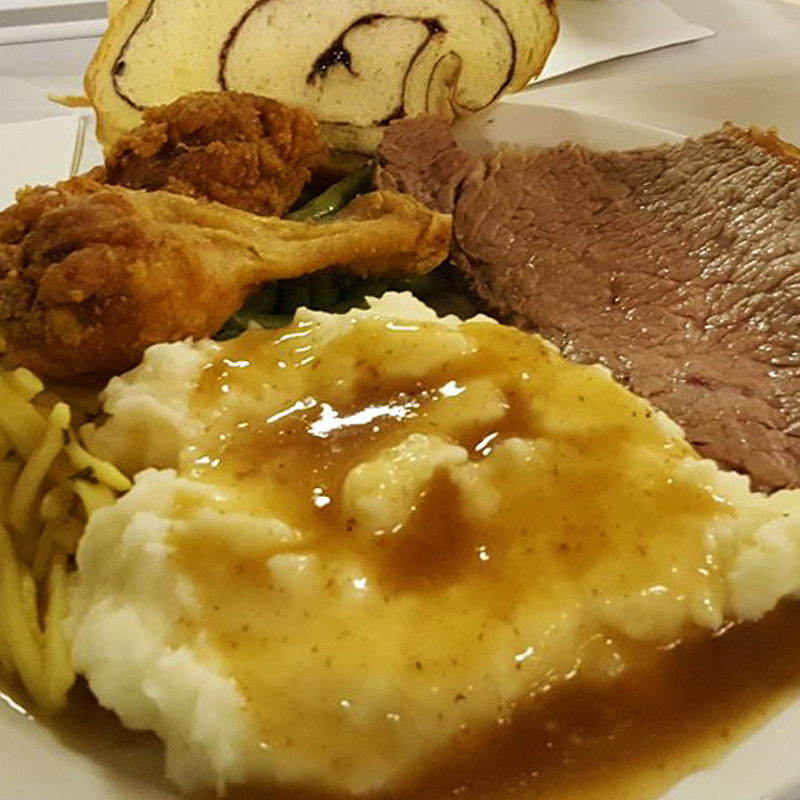 Your group will have the choice of chicken, ham or roast beef dinners. The dinners include homemade mashed potatoes & gravy, vegetable of the day, jello salad, bread & butter, and beverage. Large group meals can be ordered in both mini and regular portions. All large group meal prices will have 7.25% tax and 15% gratuity added. All dinners include a choice of 2 sides, salad, and bread. All seafood dinners include a choice of 2 sides, salad, and bread. Special plate lunches include french fries and cole slaw. Excludes Wendelle Special. Double mashed potatoes with noodles over the top. Served with choice of one side. Lettuce, ham, cheese, croutons, tomatoes, and choice of dressing. Grilled chicken, lettuce, bacon, cheese, croutons, tomatoes, and choice of dressing.